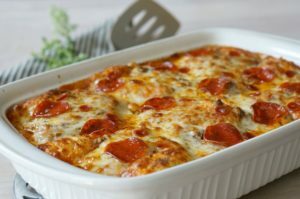 The recipe for Mickey Mouse Deep Dish Pizza Casserole, along with the content below, is a sponsored post written by me on behalf of Disney Junior. All opinions are my own. We’re celebrating family Friday pizza night with our favorite combo: deep dish pizza and Mickey Mouse! 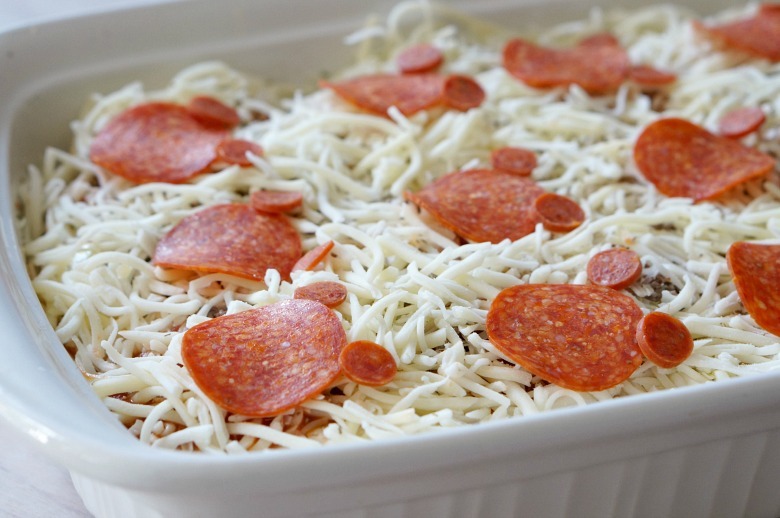 Whip up this Mickey Mouse themed Deep Dish Pizza Casserole and WOW the crowd. You’ll get smiles from ear to (mouse) ear! Friday mornings are fast-becoming one of my favorite times of the week. 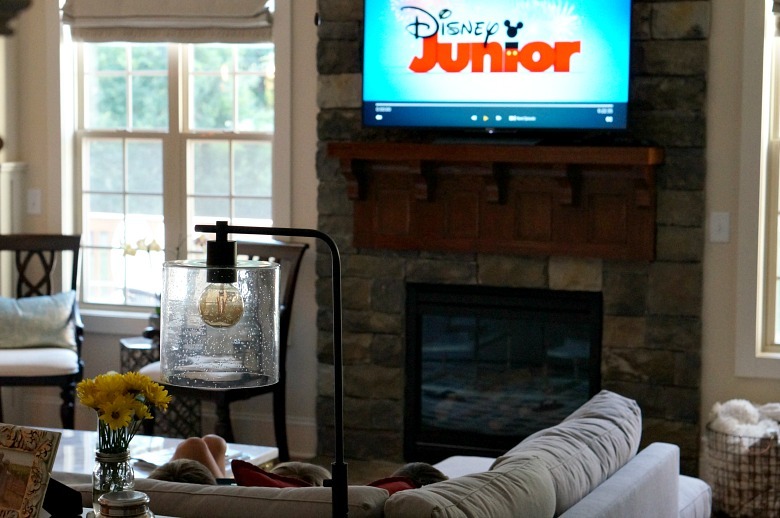 The kids are jazzed to watch premiers of their favorite Disney Junior shows on the Disney Channel, and I score a few moments for me and my cup o’ joe. Summer is passing us by quickly, and I’m trying to soak up every moment of our family-Fridays. It’s the one day of the week where it’s just my babes and me. Sigh… Moments like these that make my mom-heart swell and want to give a shout out to my pals at Disney Junior. Thank you for inspiring my kids to gather together and snuggle. This particular moment of joy was courtesy of Mickey Mouse and the Roadster Racers. 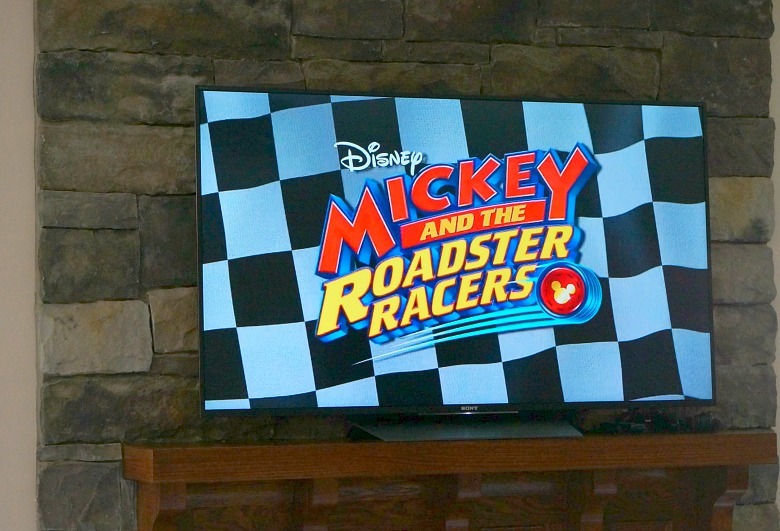 Mickey and the Roadster Racers features the Sensational Six (Mickey, Minnie, Goofy, Donald, Daisy, and Pluto), as they race around Hot Dog Hills and take on the world. My boys love watching Mickey, in his Hot Rod, along with his pals as they dodge obstacles and lend a helping hand in their community. 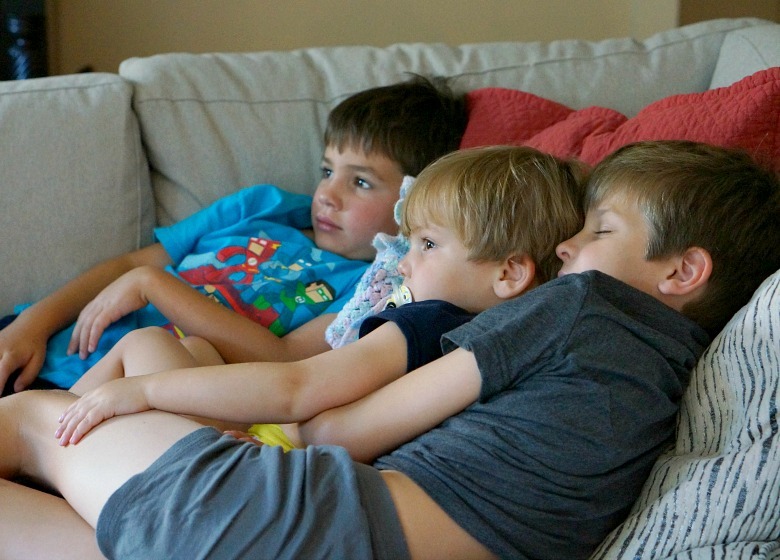 I just soooo loved watching my boy snuggle together during the show and was inspired to treat them…. surprise… with a specially themed Mickey Mouse dinner! The one thing my boys can almost always agree on is pizza. And, of course, pepperoni. So instead of giving our pizza dinner the standard treatment, I decided to get a little creative with a Mickey Mouse Deep Dish Pizza Casserole. Man… it was good. Like, double-thumbs up good, according to Will. 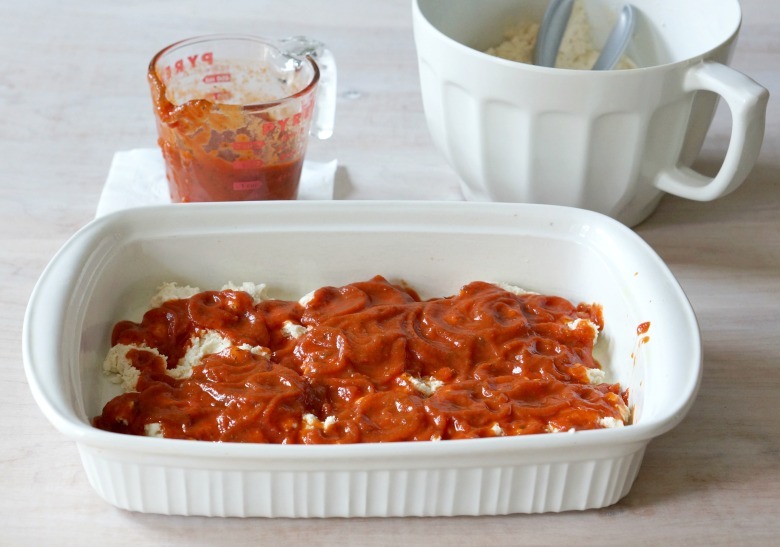 Preheat oven to 375 degrees and coat a 9×13 baking dish with cooking spray. Prep the ingredients including browning the beef along with the onion. Drain and set aside. In a large bowl, stir together the biscuit mix, Parmesan cheese, garlic powder and milk and stir until just blended. Using an ice cream scoop or wood spoon, dollop half of the biscuit mix in the bottom of the greased baking dish. Press down gently to spread. It’s okay if it doesn’t completely cover the bottom of the dish. 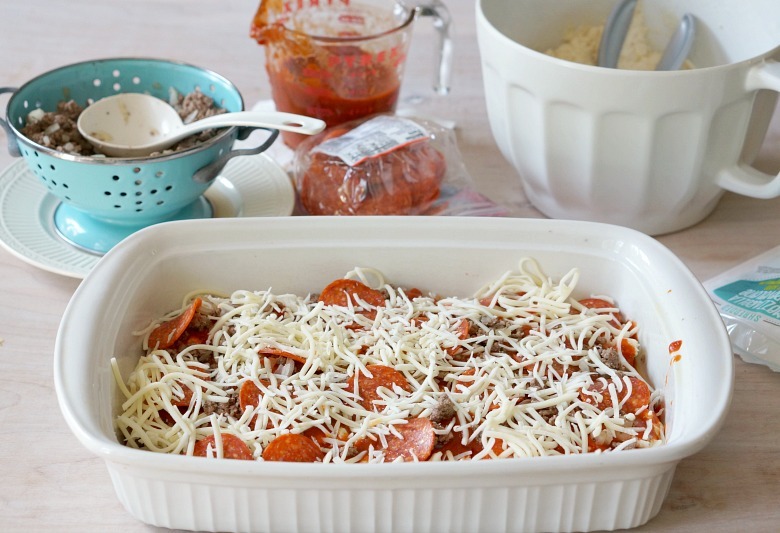 Top with half of the marinara sauce, half of the large pepperonis, half of the beef mixture, then half of the cheese. Repeat the process one more time, with the exception of the pepperoni. Once you’ve added the top layer of cheese, create Mickey Mouse heads using the large and mini pepperonis. 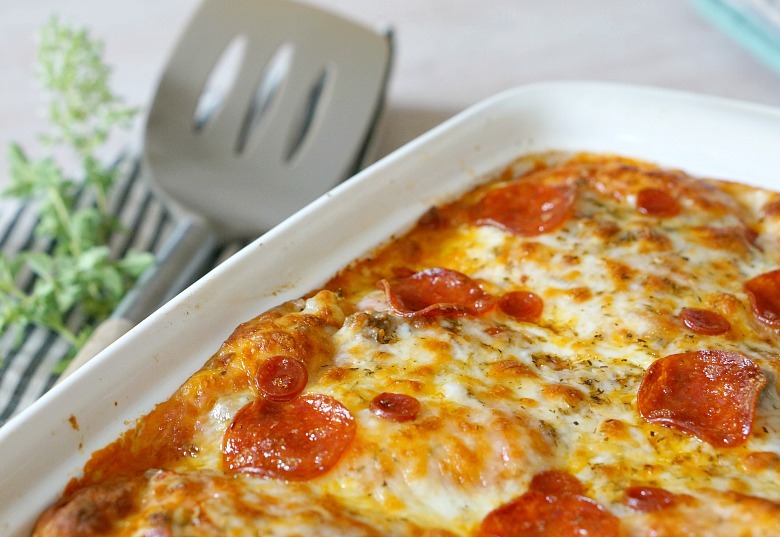 Place the baking dish in the oven and bake for 1 hour to 1 hour and 15 minutes until the dough is cooked through. For a nice golden cheesy top, place the dish under the broiler for five minutes. Broiling the cheese tends to make the ears wander off of Mickey’s head. If you want a more realistic “Mickey,” skip this step. Remove from the oven and allow to rest, about 5 minutes, prior to serving. We're celebrating family Friday pizza night with our favorite combo: deep dish pizza and Mickey Mouse! 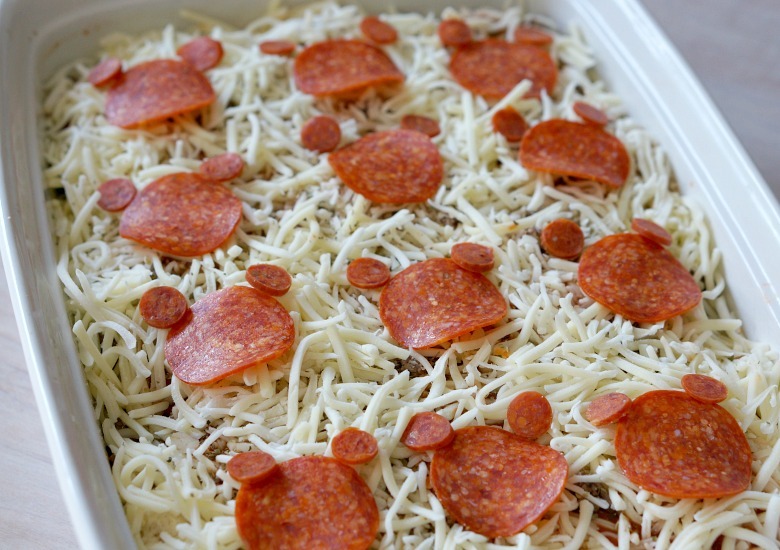 Whip up this Mickey Mouse themed Deep Dish Pizza Casserole and WOW the crowd. You'll get smiles from ear to (mouse) ear! Preheat oven to 375 degrees. Coat a 9x13 baking dish with cooking spray. In a medium skillet, add the beef and onion and cook over medium heat until the meat is browned. Drain and set aside. In a large bowl, stir together the biscuit mix, Parmesan cheese, garlic powder and milk and stir until just blended. 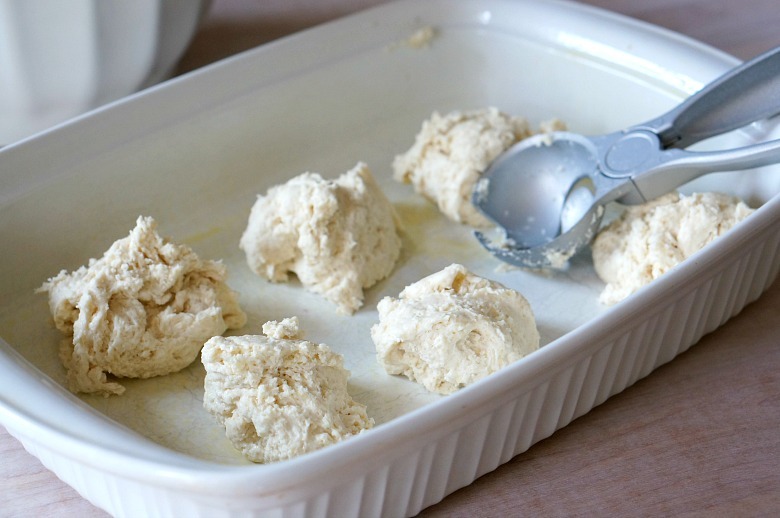 Using an ice cream scoop or wood spoon, dollop half of the biscuit mix in the bottom of the greased baking dish. Press down gently to spread. It's okay if it doesn't completely cover the bottom of the dish. Top with half of the marinara sauce, half of the large pepperonis, half of the beef mixture, then half of the cheese. Repeat the process one more time, with exception of the pepperoni. Once you've added the top layer of cheese, create Mickey Mouse heads using the large and mini pepperonis. *Broiling the cheese tends to make the ears wander off of Mickey's head. If you want a more realistic "Mickey," skip this step. Looking for some more themed treats to make with your family, check out the Chocolate Banana Ice Cream paired with the book, “Count the Monkeys,” or Snappsy’s ‘P’ Parfaits! You can find all of our Kitchen Stories series posts here.